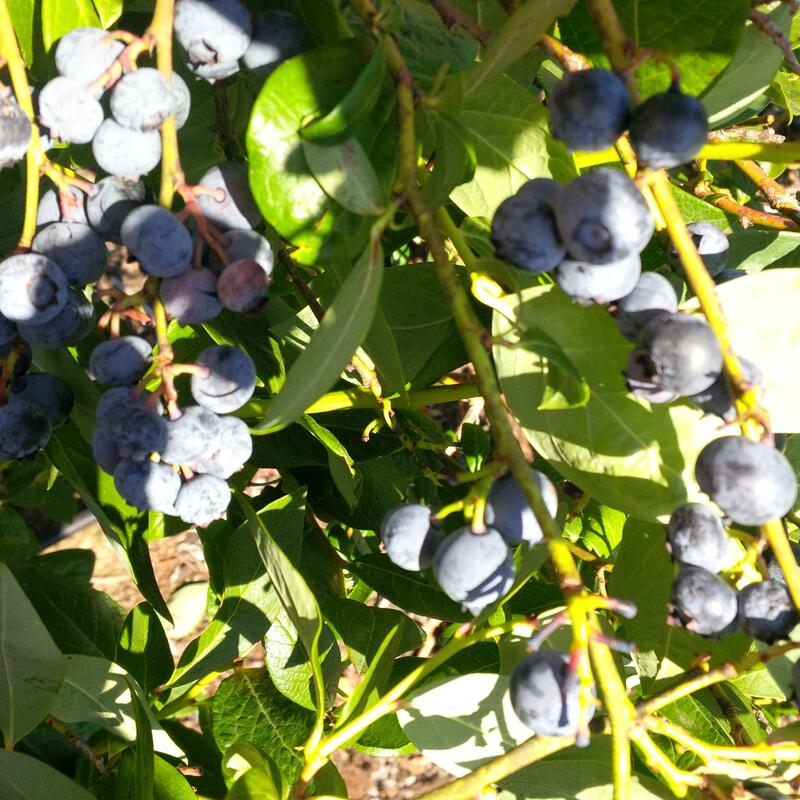 Blueberry season in the Willamette Valley runs from July to September, depending on variety. According to the Old Farmer’s Almanac, “There are three types of blueberries: highbush, lowbush and hybrid half-high. The most commonly planted blueberry is the high bush.” Among the three types there are many sub-varieties. 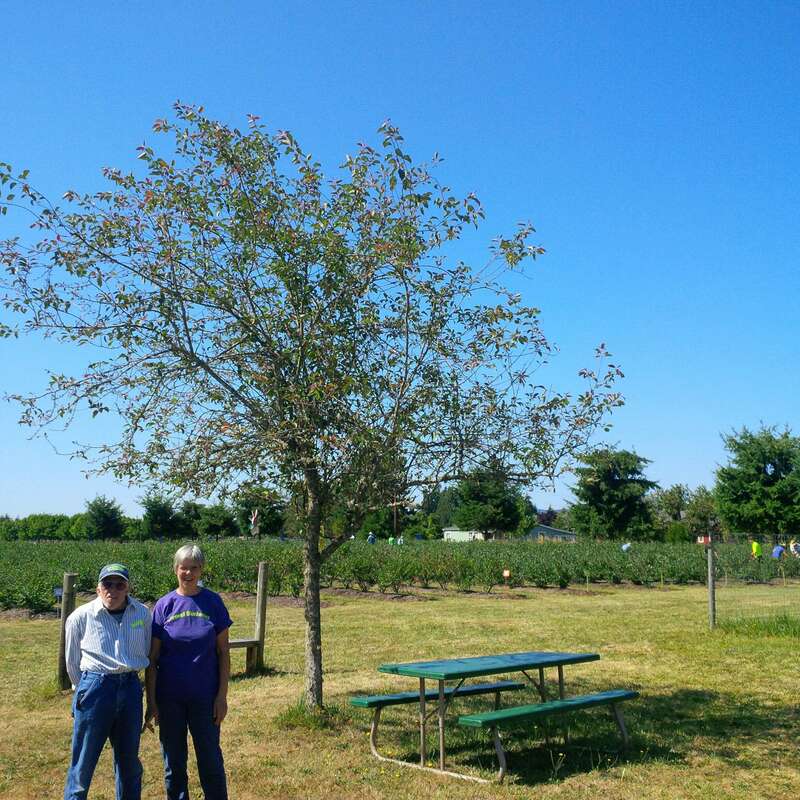 Our group was called out to glean at Creswell Blueberries, a U-Pick farm in Creswell, Oregon, just 10 minutes south of Eugene on I-5. 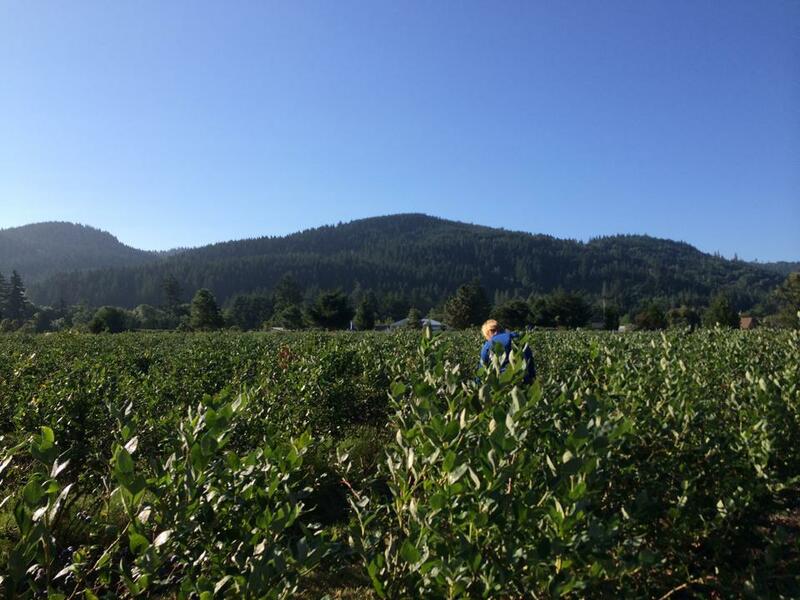 Creswell Blueberries boasts 7 different types of blueberries, organized in rows based on their type and season. 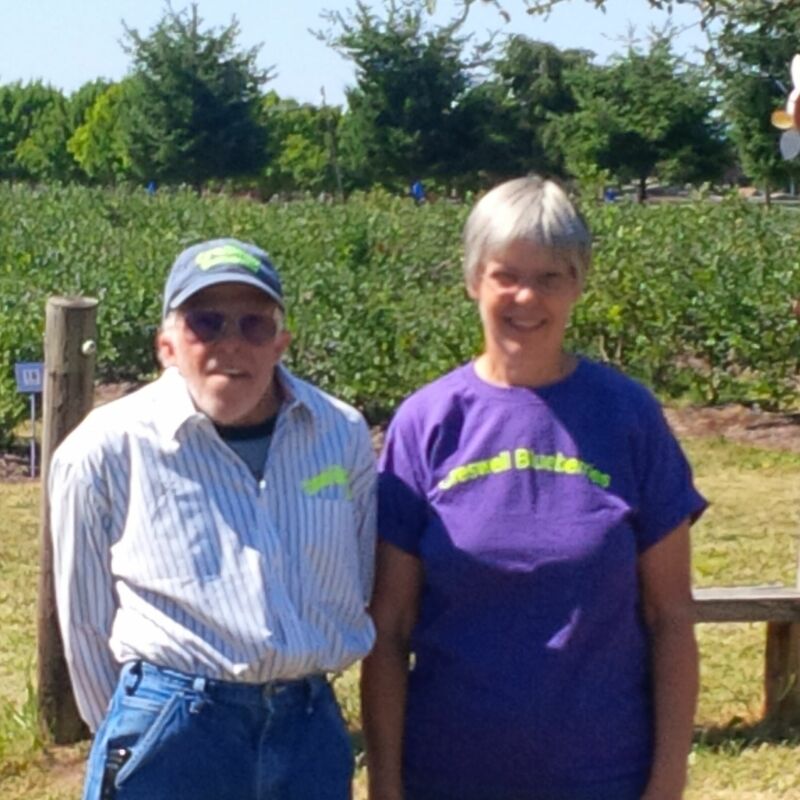 Owners Ron and Nancy have seen a bumper crop this year and wanted to share the bounty with the community. We were given rows 1-4, Draper blueberries, on the first visit. Large Draper blueberries at Creswell Blueberries. Photo courtesy of Brandy Collier. I thought a row of four when I set up the glean. It turned out to be much, much bigger than anticipated. The field is immaculately kept free of weeds, the bushes are pruned and watered regularly. The field was huge! 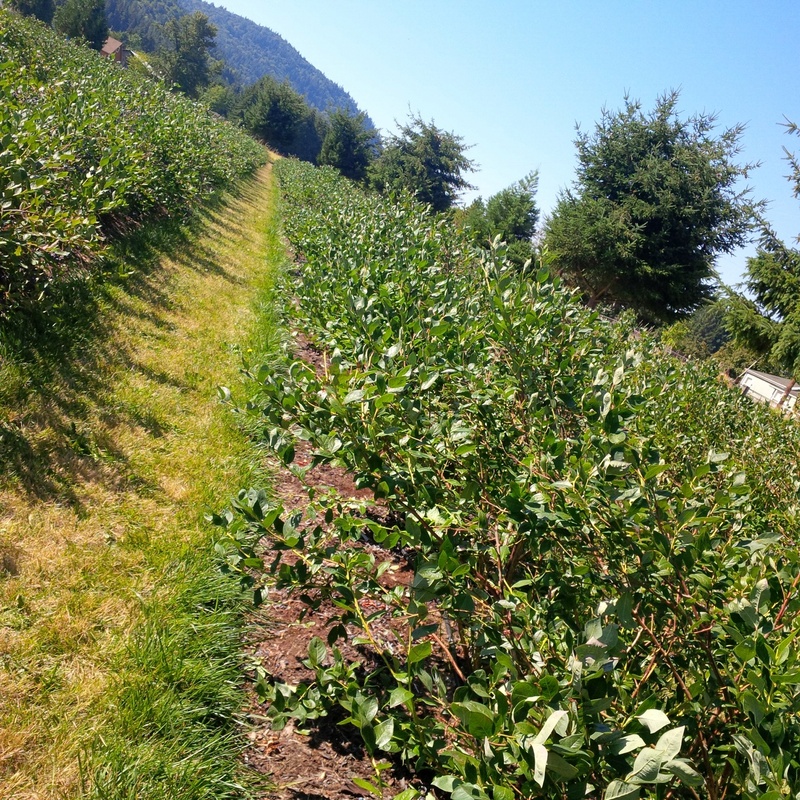 Rows of gorgeous, healthy blueberry bushes at Creswell Blueberies! Photo courtesy of Brandy Collier. Luckily it was a beautiful summer morning in Oregon. 6-8 am is the perfect time to start a picking adventure- not too hot and not too busy. Ideally the crew should arrive before the dew has dried to maximize picking time before the bees become active. Beautiful field at Creswell Blueberries. Photo courtesy of Amber Perry. 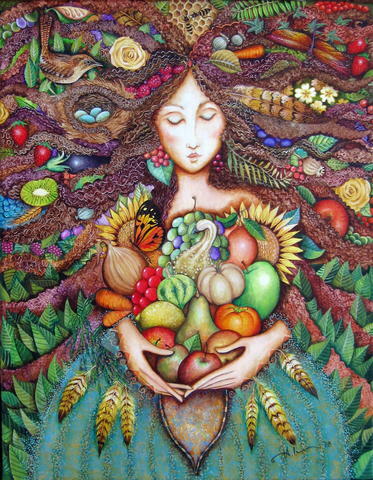 We were permitted to bring children with us to this glean, and many gleaners did. When we bring kids to gleans, they must stay right with parents and help as much as possible. I am happy to say that the kids were very well behaved and picked many buckets of berries on their own! Pickers filling buckets at Creswell Blueberries. Photo courtesy of Amber Perry. 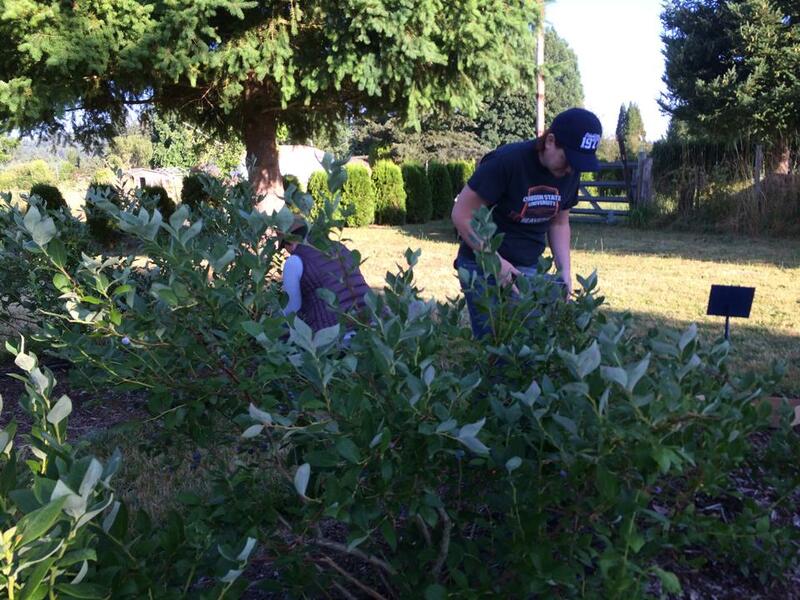 We worked well together and picked well over 180 pounds, half of which the owners donated to Food for Lane County. Our Gleaners got to keep the rest. Ron helps Roger pour some of the bounty into a transport box. Photo courtesy of Brandy Collier. The blueberries were all so huge and impossibly blue! 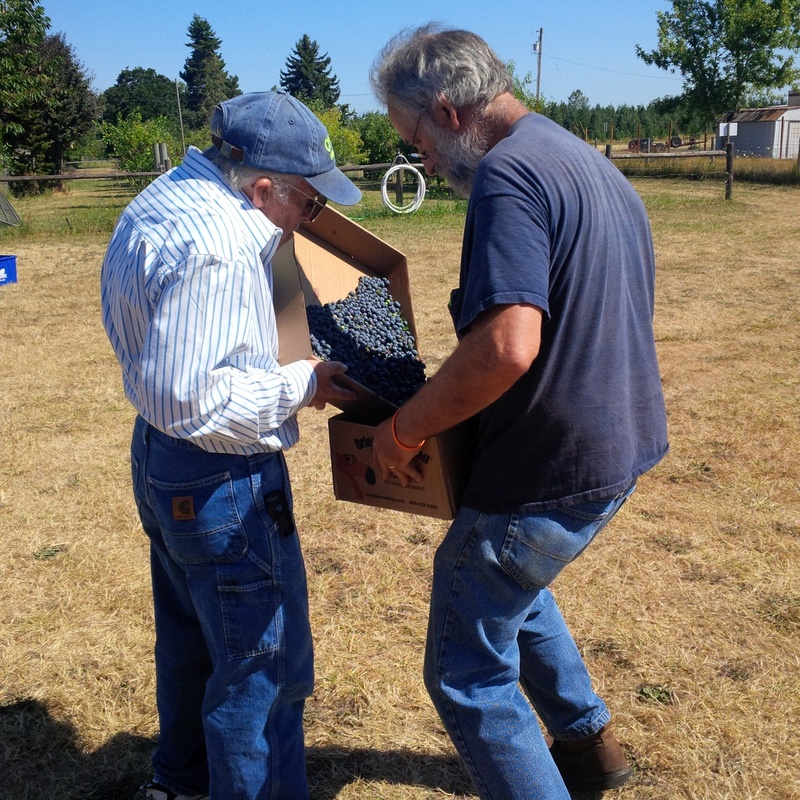 We always look forward to our trips to Creswell Blueberries, and every time someone asks for a recommendation, we never hesitate to suggest their farm. 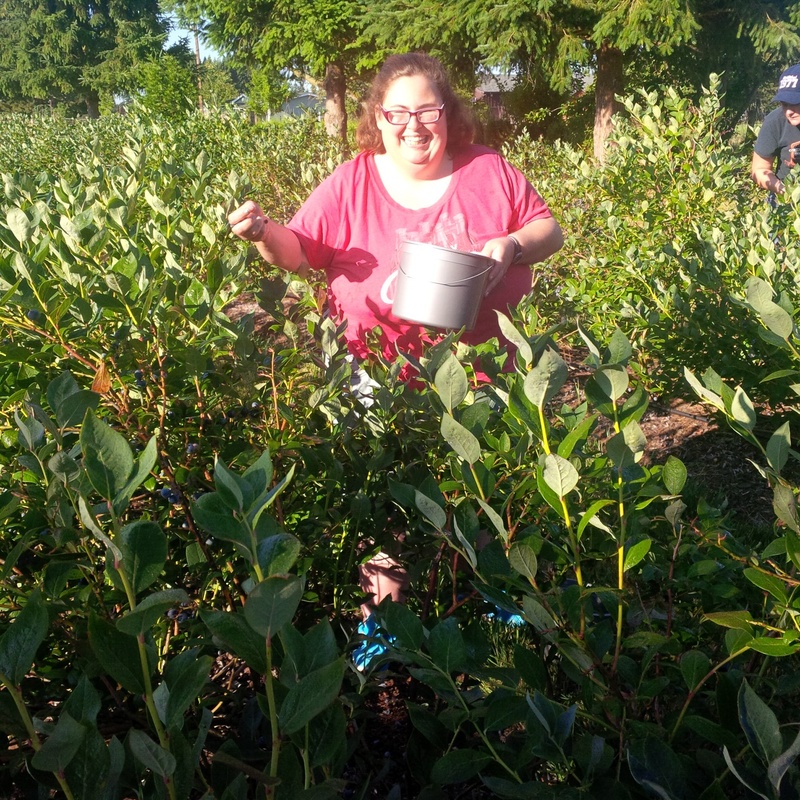 Amber Perry, volunteer gleaner, working at Creswell Blueberries. Photo courtesy of Brandy Collier. Thank you Ron and Nancy!